Critically acclaimed rapper and producer, Big K.R.I.T., premieres the official video for “Big Bank” featuring 3x Grammy Award-Winning artist, T.I. The “Big Bank” visual, directed by Motion Family, is a reflective nod to the braggadocios, country demeanor of Big K.R.I.T. who has expressed “that’s just me being country, being southern, over a sample-melodic amazing song with knock.” – NPR. Recently Big K.R.I.T. has announced, his “HEAVY IS THE CROWN ” 2018 National Tour that will kick off in Little Rock, AR on March 15th – spanning out until April. 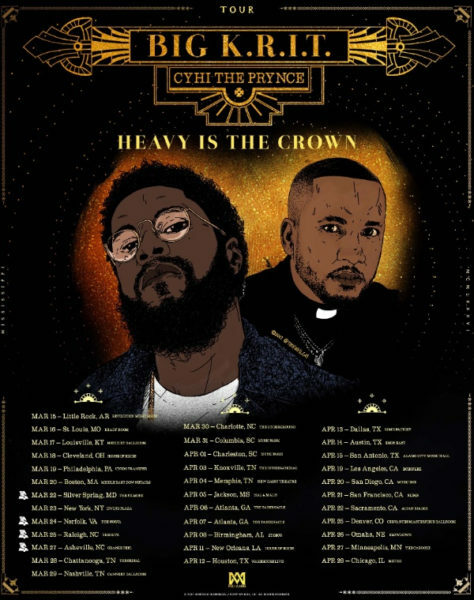 Cyhi The Prynce, will be joining Big K.R.I.T. on all tour dates. Coupled with this addition, Big K.R.I.T. has added six new dates to his tour routing including stops in Little Rock, AR, Philadelphia, PA, an expanded venue from Gramercy Theatre to Irving Plaza in New York City, Columbia, SC, Charleston, SC and an additional date in Atlanta, GA at The Tabernacle due to an overwhelming response in ticket sales. Be the first to comment on "Big Krit Drops The Visual To “Big Bank” featuring T.I. and Announces “Heavy Is The Crown” Tour"